Why getting online referrals is important. Most of the contractors I have talked to over the last number of years have one thing in common, and that is that much of their business comes from referrals. That is great, referrals are the best form of advertising your can get. Not only is it free but you also have a bit of trust and rapport built up with the referral already based on the relationship with your previous client. The limitations of a word of mouth referral though are great as traditional word of mouth referrals has to be in a direct setting. Your happy client has to be in a position to be speaking with a friend, colleague/ family member that is in a position to want and need home services. Not only that but you as a home sservices or contracting business may be completely unaware that this conversation is about to take place and further to that you have no idea what is going to be said. Now think about the social age where everything is online 24/7 for everyone in the world to see. If you were to take that happy client that loves your service and have them post a review of your business online many things happen. 1. You can monitor the message; if there were any issues you could take action on it right away thus increasing your quality of service goals. 2. This gets shared out on various search engines, and search engines love third party user generated reviews. Many sites have built billion dollar businesses out of it. 3. This is online 24/7/365, so now anyone in the area that happens to be looking for flooring can potentially see the review from your happy customer. It’s like them being at a dinner party raving about their new floors only that dinner party has hundreds if not thousands of people, and all the guests are looing at getting some flooring work done. So the next time your think online reviews don’t matter maybe you should give it a second thought. 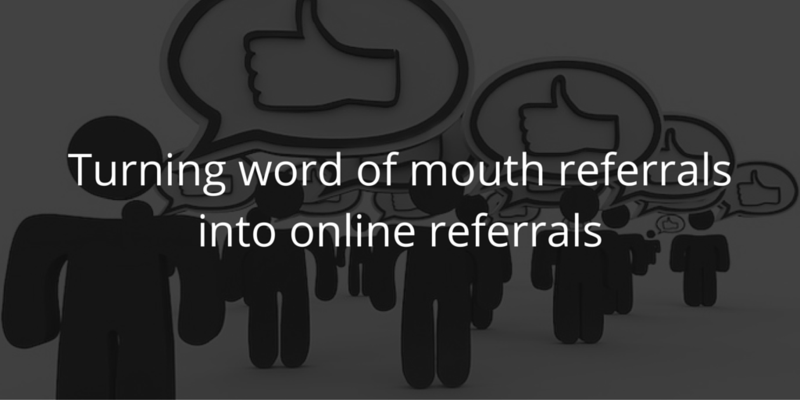 Online referrals are powerful.